A question brought up in ART347 today from a reading assignment... Can you shoot entire rainbows with a panoramic camera or lens, and what is it with never seeing rainbows at sunrise. Answer... Yes it can be done, it does happen, and I have photographic evidence. 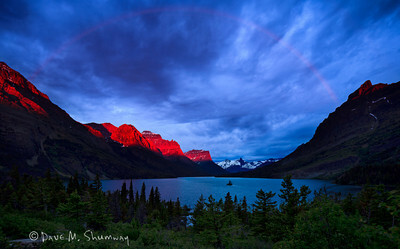 The above image is a 5 image panoramic image captured in Glacier National Park at sunrise during my July 2010 trip. The images shot with a Canon 5D II and 24/3.5L T/S lens manually exposed at f/13, ISO100, and 1.3 seconds. The images were taken with 2° of tilt and were taken in succession with 12mm of shift at 90° angles to capture all of the scene. The image was later cropped to 7500X4800 pixels from the 7600 pixel square image that was created in a stichless panorama. It shows a sunrise rainbow, and the use of a panoramic lens, technique, to capture all of the scene. One thing to be careful of when attempting to photograph a rainbow using panoramic techniques is that things move quickly and you need to get from shot to shot quickly; but without making a mistake. I fired off this five image set, and went to start another, and it was gone. The few other folks present that morning did not notice the rainbow in time to get reset to shoot it before it was gone. Light is fleeting, especially those really magical moments (i.e., rainbows). Sunrise the next morning brought better light; but no rainbow. You can check out the next days sunrise at the same location and the rest of the trips photos here (notice the added field of view from shooting a panorama). Oddly, this image is something I just edited just the other night. I had forgotten about it when I did my main edit after the trip; because of its size it took a long time for Photoshop CS5 to put it together, and after it failed the first time I did not try again. My new machine did a much quicker job and even though it took a few attempts my new machine was 3-4Xs faster, so I was able to be patient, and I am very glad I was.